Just like the ALDI tortilla chips, if you’re looking for potato chips to buy, go no further than ALDI. The price is the right. The quantity is right. The taste is right. You’re unlikely to find a better chip or a better price than these everyday chips. These are not low salt, high salt, no salt, sea salt, kosher salt, vinegar salt, salt-less, salt-more, artificial salt, table salt, rock salt, movie Salt, flavored salt, buttered salt, unrefined salt, double fortified salt, caked salt or baked salt chips. 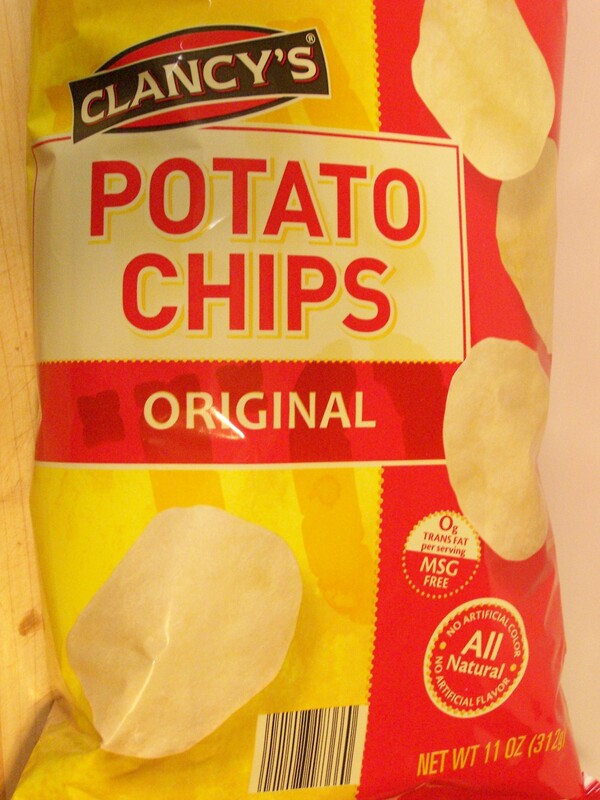 These are just old, when there used to be only one kind, style plain potato chips with salt. These are not wavy, navy, hazy, lazy, thick, slick, mashed and then smashed by giant hydraulic presses (up to the point where cold fusion is obtained) into circular curvilinear shapes that neatly stack in a cylindrical can, crunched, scrunched, bunched, hunched, munched (well not in the bag at least), crinkled, wrinkled, baked, staked, settled, nettled, or kettled potatoes. These are just, thinly sliced potatoes fried in vegetable oil and then sprinkled with salt, chips. Why does it have to be more complicated? This entry was posted on 12/23/2011 at 12:37 and is filed under ALDI, Recipes, food, cooking and related items. You can follow any responses to this entry through the RSS 2.0 feed. You can leave a response, or trackback from your own site. Recently I found a combo pack that included four flavors of chips: original, bbq, sour cream and onion and salt and vinegar which I thought was great since the kids don’t like the cheese curls. However I only saw this pack once. Does anyone know if these will be available regularly? I hope so. Your best bet is to ask the staff at your local ALDI. They’ll know if that’s a regular item or one of those frustrating things which may never appear again. Still no salt free rippled chips. Here’s the customer contact URL for ALDI. We really love the baked rippled sour cream and chedder. Would love them to be avaliable all year. Bought 10 bags last month and good thing because sadly they are gone from the store again. I am looking for the clancys beer chips! Omg there the best! Not at Aldi anymore. If that fails, try an internet search for a different brand of beer chips. I’ve never tried any from the internet, so I can’t say if they’re good or bad. There’s at least one out there. The bags of clancy chips used to bear a kosher symbol, now there isn’t one. Why? Good observation and question Joel. Here’s the URL to email ALDI directly with that question. https://www.aldi.us/en/contact-us I’m just a customer like you. I used to buy peppercorn ranch chips. Can’t find them anymore. Do you still make them. I agree. when I serve Clancy’s at parties, someone always asks where I got them, because they taste so good, natural and crisp. Why can’t I get 50% less sodium chips anymore? Loganville, Ga. used to carry them, but not anymore. I buy 1 combo pack of chips every week, along with other chips. My husband called me from work today asking where I bought the chips. I said Aldis . When he opened the bag their was a chunk size 3 X 3 of what looks like chocolate cake deepfried. I will be happy to send you this. Thanks for listening. Discussed patron. Many companies offer no-salt chip but no one has salt free ripple chips. Most dips are salty, the dipping chip does not have to be. It might be too latge to get this produced this year but I hope that Clancy steps up to the task. I am sure it will be a seller. these chips are real food! 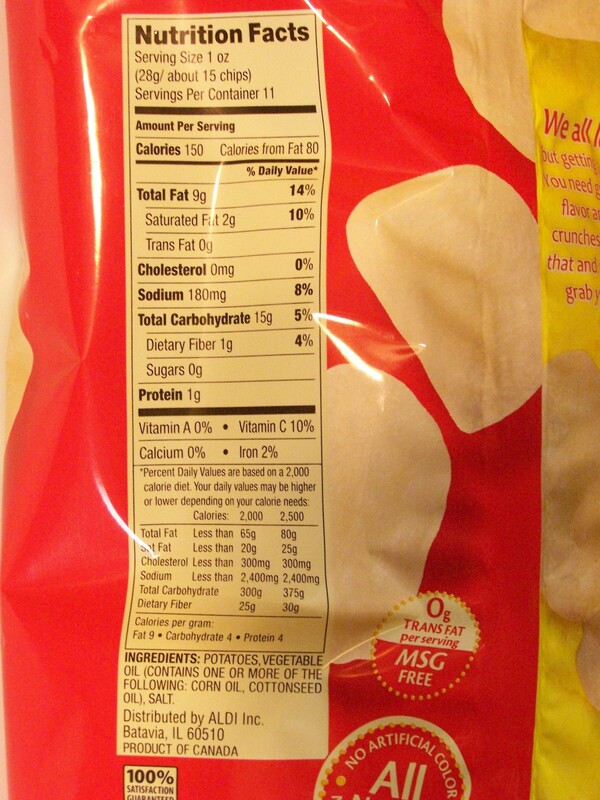 No MSG no trans fat no artificial crap! I think they’re awsome! They taste great to! Real food generally does. We’ve been conditioned to like all the frankinfood crap thats on the market today so when we taste a healthy food at first we say yuck… Only after eating it for awhile do we begin to realize that the healthy food is tastes so much better then the frankin food. Personally I did not care for the newer chips without salt, I was disappointed.